ECOTIC is a private organisation is a not-for-profit foundation, which was set up with the encouragement of the main companies in the consumer electronics industry. Incorporated on 7 March 2005, ECOTIC works to defend the environment and promote sustainable development by raising awareness and by training manufacturers, distributors and electrical and electronic equipment users. Our main area of work is the proper management of waste electrical and electronic equipment (WEEE) for companies and organisations that use our Extended Producer Resposibility System (EPRS), in response to the legal requirements on producers and distributors of electrical and electronic equipment. Our management of waste not only ensures that recycling is done properly, but that it is done as efficiently and economically as possible, optimising resources earmarked for the financing of the process, and thereby ensuring that the system is sustainable and ensuring its durability over time. With authorisation to manage the 10 categories of WEEE at national level, and working with a wide network of authorised recyclers, and with more than 7700 collection points spread around Spain, ECOTIC has today consolidated its position as the leading organisation in Spain for disposing of electronic waste. Our main objectives are to protect the environment and promote sustainable development, and we work towards goals using numerous initiatives. Establishing, developing and managing the collection, treatment and management of waste electronic appliances, equipment and components at the end of their useful life, ensuring that resources aimed at recycling are best used. Conducting studies and research into the collection, treatment and management of WEEE. Disseminating information about the collection, treatment and management of this type of waste - both among professionals and within society as a whole. Carrying out scientific and technology activities for discussion and training on WEEE and management. Promoting a culture of sustainable development with regard to electrical and electronic equipment and appliances. ECOTIC’s activities would not be possible without the support we’ve received from the business community. 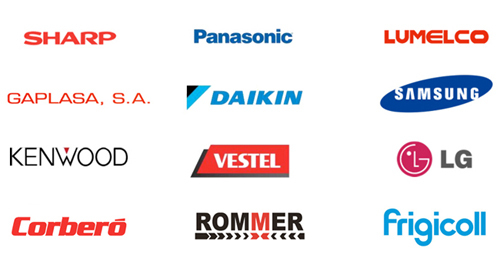 We were set up and are promoted by some of the most important companies within the consumer electronics industry, under the framework of AMETIC (the cross-industry association of electronics, ITC, telecommunications and digital technologies companies). Projects & Companies Area: The team handles market control and engaging and building company loyalty, as well as technical project management and our participation in national and international forums. Operations Area: Responsible for organising, managing and monitoring logistics and processing WEEE. This area also handles contract negotiation and agreements with distributors, treatment companies and plants, and authorisations and relationships with regional governments and local authorities. Finance Area: The main function of this area is to coordinate and control the Foundation's financial and administrative operations, with the aim of providing information to the Board and governing decision-making body. It is also responsible for external reporting on matters arising from the Foundation’s legal nature and commitments to public organisations. ECOTIC’s Integrated Quality and Environment Policy is a statement of its intentions and principles that provides an overall framework for setting targets relating to the comprehensive management of quality and the environment. Our Quality Management System is ISO9001 and ISO14001 accredited. ECOTIC’s management team is committed to involving all employees and partners, in achieving quality and environmental objectives, and to review this annually, communicating it to all employees and making it available to the public. ECOTIC is a not-for-profit organisation that coordinates the management of waste electrical and electronic equipment (WEEE) for its member companies, using its Extended Producer Responsibility System (EPRS). 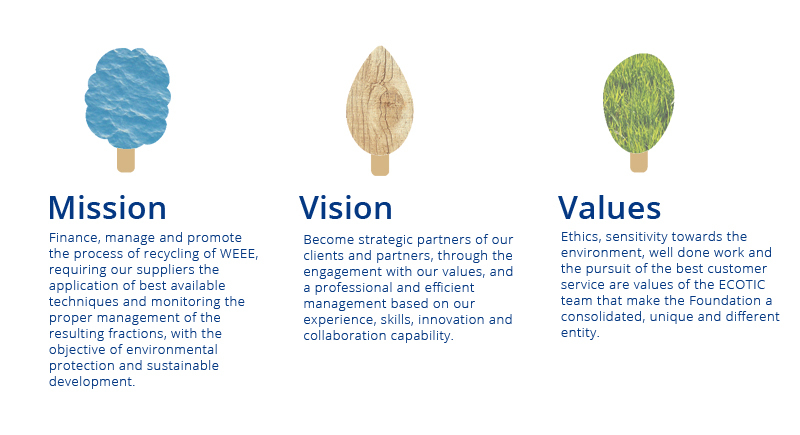 Our commitment to society is focused on financing and promoting any activities that help optimise the management of WEEE reuse and recycling. We focus on reuse and rationalisation of recovered materials and turning them into resources. At ECOTIC, we aim to become strategic partners through our commitment to conduct a professional and effective management based on our experience, skills, and ability to innovate and collaborate, establishing true partnerships with the aim of mutual improvement to achieve shared goals. Complying with legal requirements - such as those endorsed by the Foundation and in particular Royal Decree 208/2005 regarding electrical and electronic equipment and waste management, in relation to the Foundation’s market share, and promoting a commitment to all stakeholders involved in processing waste. A commitment to continuously improve our services, prevent pollution, reduce environmental impact, and maximise the opportunities offered by management systems and new technologies. Understanding clients’ needs and expectations and ensuring they are met, guiding the entire organisation in the proper development of processes and the quality of service that we provide, based on criteria of ethics, efficiency and effectiveness. Implementing, maintaining and reviewing the integrated management system as a framework for establishing and reviewing quality and environment objectives and designing mechanisms to ensure that the policy is communicated both within and outside the Foundation, to service providers and the public in general. Ensuring that ECOTIC’s staff, being our main asset, have job satisfaction and are motivated, by helping them develop personally and professionally, and promoting lifelong learning, teamwork and a good working environment. A passion for service, innovation, resource optimisation, management efficiency and transparency are values that make up ECOTIC’s DNA. These core values are shared by the organisation’s whole team, without whose commitment and professionalism it would not have been possible to achieve the goals we set for ourselves, and which have enabled us to grow in a sustainable way year after year. "So far, at ECOTIC we have managed more than 622,000 tonnes of electronic waste"
Thanks to the work done over the years, we have managed to recover and recycle an enormous amount of materials that have gone through our production processes, thus helping to avoid the depletion of increasingly scarce and expensive finite natural resources. 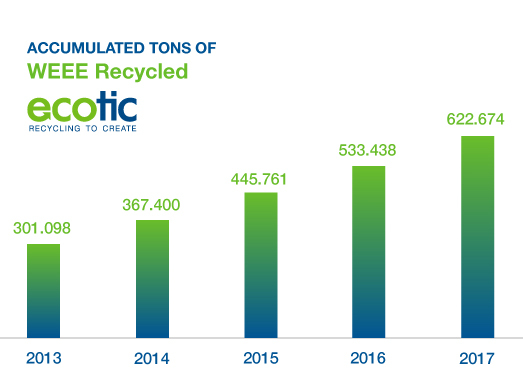 At ECOTIC, we collaborate on R&D activities that enable improvements in WEEE recycling-related techniques and processes, in order to be able to respond to new needs arising from the rapid technological development that we are currently experiencing. In this regard, we highlight our participation in the WEEE Forum and the HTWT project, described in more detail in the recycling technologies section. In addition to recovering materials, we’ve managed to avoid the potential harmful impact of waste on the environment and to people’s health. For example, a mobile phone’s nickel-cadmium battery can contaminate 50,000 litres of water or 10m3 of soil. A cathode ray tube TV containing heavy metals, lead in the glass and phosphor in the screen can contaminate up to 80,000 litres of water. Even a simple fluorescent light can affect 16,000 litres of water.